Mumbai: It is a good time to be a start-up, or so thought a lot of people at BarCamp Mumbai 2, which took place on 14 October at the Indian Institute of Technology (IIT), Bombay. The second chapter of BarCamp, hosted by Mumbai after a year-and-a-half subsequent to the first, had greater emphasis on entrepreneurship and less on technology. A majority of the 200 attendees were either already working with start-ups, had set up their own companies or aspired to do so. The mix included a banker who wanted to start a referrals portal, a management consultant who ran a community website and students with ideas. Companies in the technology space, though, are taking notice of the ‘unconference’ forum. Bakshish Dutta, general manager (market development) for Sun Microsystems India, was at the event scouting for candidates for the company’s start-up essentials programme, and possible business collaborations. The event kicked off with an introductory session on the agenda for the day. But networking and offline discussions, typical of a BarCamp, were hampered by two things. First, there were four parallel sessions and the topics of common interest often clashed. For instance, there were two discussions on start-ups that ran simultaneously. The most well-attended sessions were those dealing with start-up issues. True to its status as the financial capital, Mumbai’s BarCamp topics dealt more with the business aspects of running a start-up—potential business models, the pros and cons of equity financing versus debt and how to write business plans. Aloke Bajpai, CEO of travel search start-up iXiGO.com, led a lively discussion on the next “killer application" for start-ups. He asked a roomful of attendees to suggest start-up ideas they are working on or planning to launch. Within 10 minutes, the white board had a list of more than 20 ideas—several of them operational—ranging between toy manufacturing, hand-cranked mobile chargers and independent music labels. Other sessions included Murthy’s talk on what VCs look for, and one on dos and don’ts for start-ups by Murli Ramkrishnan from real estate portal RealAcres.com. In an unusual feature for a BarCamp, the event also hosted the city’s first Open Coffee Club meet at IIT’s open-air canteen. While it had no defined agenda, about 20 BarCampers decided to improvise. The topic of discussion—independent software vendors (ISVs)—came about during a round of introductions. An ISV is usually a very small team, or often just an individual, which caters to a niche segment of the market not dominated by large players. An ISV, which will not have more than two or three products in its portfolio, can have a reasonably profitable business, but does not scale up. The idea of being an ISV all your life was not ambitious enough, felt some. But everyone agreed that working as an ISV is a good way to raise money to bootstrap your start-up. 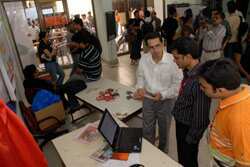 Several start-ups used the forum to showcase their products. Vakow!, an entertainment-focused portal that offers SMS forwards across different categories, gave a product demo. Founder Rahul Gupta was seen talking to Aggregatorz.com, a news aggregation portal, for possible content syndication. Bloozle, a portal for online debates, and Novix, a mobile video streaming start-up, also showcased their products.